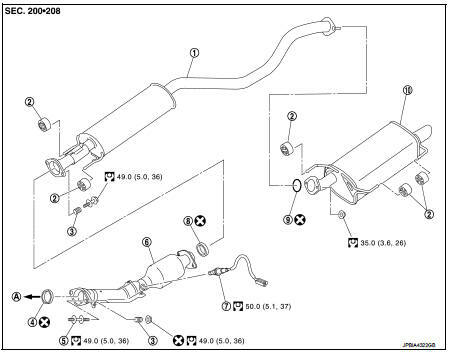 • Remove heated oxygen sensor 2 with following procedure: - Using heated oxygen sensor wrench [SST: KV10114400] (A), removal heated oxygen sensor 2 (1). Catalyst convertor to Exhaust Front Tube 1. Securely insert seal bearing (2) into catalyst convertor (1). Exhaust Front Tube to Center Muffler 1. Securely insert seal bearing (2) into exhaust front tube (1) side in the direction shown in the figure. • Check clearance between tail tube and rear bumper is even. 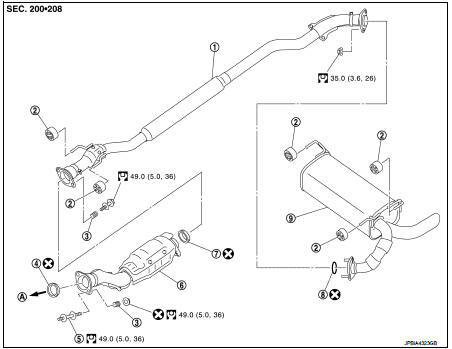 • With engine running, check exhaust tube joints for gas leakage and unusual noises. • Check to ensure that mounting brackets and mounting rubbers are installed properly and free from undue stress. Improper installation could result in excessive noise and vibration.